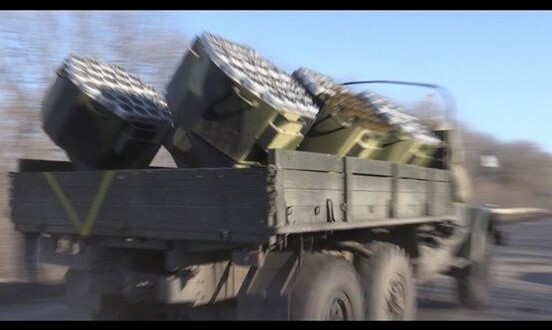 The above screen grab from video filmed in mid-February shows a Ukrainian government-operated UMZ (Universalnyj Minnyj Zagraditel; universal minelayer) scatterable mine laying system, atop a ZIL-131 truck chassis, operating on Debaltseve road, Ukraine. Designed by the USSR in the late 1970s, the UMZ was adopted by the Soviet Army in the early 1980s, and consists of six individual launcher units each containing 30 tubes. From within the truck cabin the operator can manually adjust the tilt angle and rotation of each launcher unit before dispensing mines. The UMZ can deploy multiple mine types, and is capable of carrying different types simultaneously so as to set mixed anti-personnel and anti-tank minefields. Below are the maximum numbers of each mine type the UMZ can carry, assuming only one type of mine is loaded. The depth (or width) of the minefield produced can range between 15 and 240 metres, with the launch unit capable of laying these at a speed of up to 40 km/h. Depending on the tilt angle of each launcher unit, the UMZ can lay a one, two or three-lane minefield in one pass. In so doing, the maximum length of the minefield is a half or third of the minefield lengths given below. 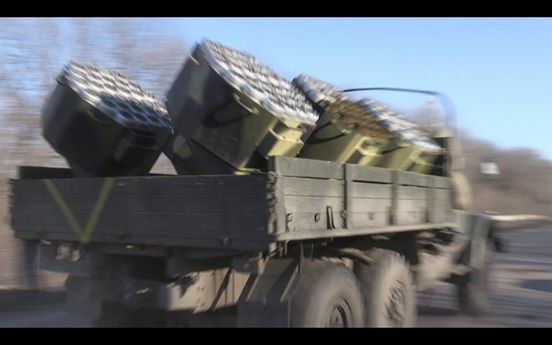 It is unclear what type of mines the UMZ sighted on Debaltseve road was carrying, though a day later it was reported that a pro-Russian separatist vehicle was destroyed, killing one and injuring another. It is not clear whether this incident was related to the presence of a UMZ. Another picture from last week shows additional mines said to be on the road between Logvinova and Luganskim, near Debaltseve. These mines are not compatible with the UMZ system. Technical data from here and here. 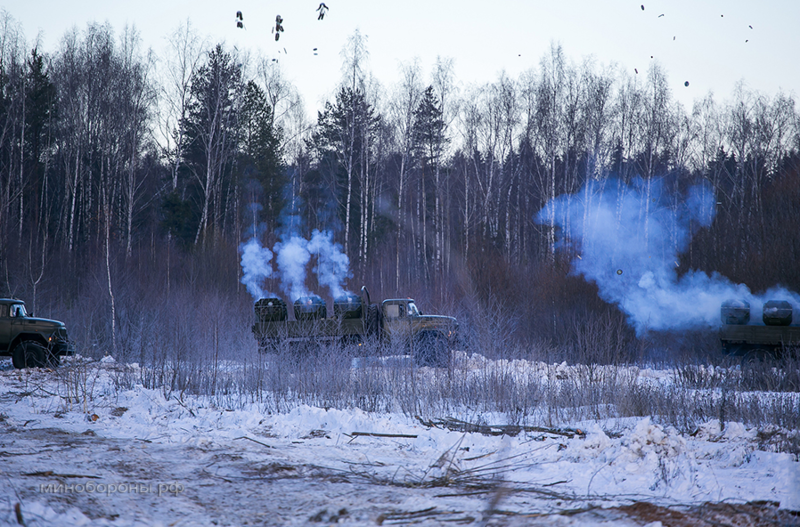 Additional image from Russian Defense Ministry website. With special thanks to Mark Hiznay, Yuri Lyamin, and Balint Szlanko. In the first picture, does it appear that the center-front pod is loaded with two different types of mines? Two colours could indicate different types, or different production runs of the same type. We are looking for further information.